This set of Digital Electronics/Circuits Multiple Choice Questions & Answers (MCQs) focuses on “Introduction of Arithmetic Operation”. Explanation: The basic building blocks of the arithmetic unit in digital computers are adders. Since a parallel adder is constructed with a number of full-adder circuits connected in cascade. By controlling the data inputs to the parallel adder, it is possible to obtain different types of arithmetic operations. 2. A digital system consists of _____ types of circuits. Explanation: A digital system consists of two types of circuits and these are a combinational and sequential logic circuit. Combinational circuits are the ones which do not depend on previous inputs while Sequential circuits depend on past inputs. 3. In a combinational circuit, the output at any time depends only on the _______ at that time. Explanation: In a combinational circuit, the output at any time depends only on the input values at that time and not on past or intermediate values. 4. In a sequential circuit, the output at any time depends only on the input values at that time. Explanation: In a sequential circuit, the output at any time depends on the present input values as well as past output values. It also depends on clock pulses depending on whether it’s synchronous or asynchronous sequential circuits. A. From the word description of the problem, identify the inputs and outputs and draw a block diagram. B. Draw the truth table such that it completely describes the operation of the circuit for different combinations of inputs. C. Simplify the switching expression(s) for the output(s). D. Implement the simplified expression using logic gates. E. Write down the switching expression(s) for the output(s). Explanation: Combinational circuits are the ones which do not depend on previous inputs and depends only on the present values. The given arrangement A, B, E, C, D is the right sequence for the designing of the combinational circuits. Explanation: Since the logic gates NOR and NAND are known as universal logic gates, therefore it can be used to design all the three basic gates AND, OR and NOT. Thus, it means that any operations can be obtained by implementation of these gates. Explanation: The design of an ALU is based on combinational logic. Because the unit has a regular pattern, it can be broken into identical stages connected in cascade through carries. 8. If the two numbers are unsigned, the bit conditions of interest are the ______ carry and a possible _____ result. Explanation: If the two numbers are unsigned, the bit conditions of interest are the output carry and a possible zero result. Explanation: If the two numbers include a sign bit in the highest order position, the bit conditions of interest are the sign of the result, a zero indication and an overflow condition. Explanation: In an ALU, status bit conditions are sometimes called condition code bits or flag bits. It is so called because they tend to represent the status of the respect flags after any operation. 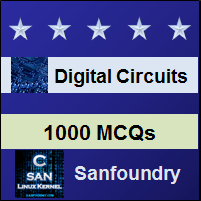 To practice all areas of Digital Circuits, here is complete set of 1000+ Multiple Choice Questions and Answers.